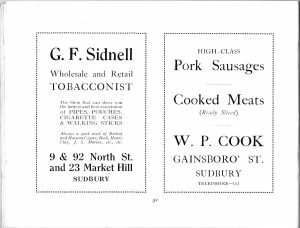 One of the small guide books of Sudbury which came into the Sudbury Ephemera Archive in the very first months of its existence has some interesting adverts of businesses in the town during the first half of the twentieth century but post World War 1. 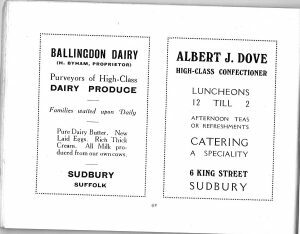 These adverts show how much the people of Sudbury could purchase locally and not have to rely on travelling to larger towns like Bury St Edmunds, Ipswich or Colchester. Most people would have had to rely on public transport at this time; travel would have been slower than it is today. There would have been no question of two or more cars owned by one family. 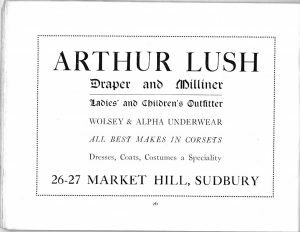 The adverts often show an address for the shop or business. The adverts are plain but get the message across clearly about what is sold at these establishments. 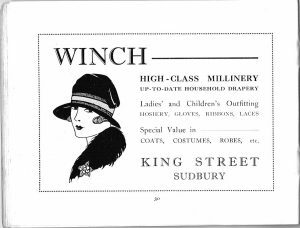 Adverts like these also give the impression of what goods are currently in demand in local society and as fashion and technology change so do the commercial enterprises of the town.